The stone that sculptors use most often is serpentine. It covers a range of colors from olive green to shades of brown to black. The color at the edges of stone often turns into a brown or reddish-brown color, and sculptors know how these transitions of colors masterly use and incorporate them into their sculptures. The stone used for statues is mined by hand in the quarries in Zimbabwe. The use of explosives could disrupt the internal structure of stone sculptures and cause cracking during processing. The rough shape of sculpture is reached by using a chisel and hammer; then the softer contours are made by a special hammer for sculpting (a hammer has a blade with three or five points). 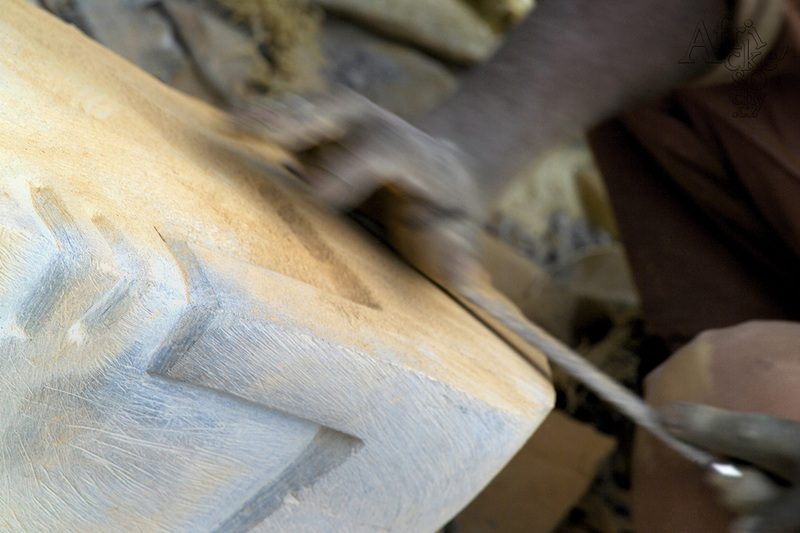 The surface of sculptures is smoothed firstly with rasp, then with the finer rasp and finally honed by wet sandpaper. The finished sculptures are heated by an open fire and the whole sculpture or only selected areas are infused with wax. Wax is literally soaked in warm stone; the originally gray color of stone darkens and fine structures in stone, metal veins and spots in different colors can be nicely seen.